Warmer days mean a change up in my hair care routine and as most curly girls now know, it is quite popular to change up a few things when moving into a new season. There is no steadfast rule on changing up hair oils for every curly, as that depends on your own hair, climate, age, and health. Despite that, we’ve come up with a great list of five lightweight oils that are sure to win you over this spring and summer. Argan oil is a light plant-based oil produced by cold pressing from an argan nut from the argan tree, which grows in Southwestern Morocco. It is high in vitamin E, palmitic, stearic, oleic, and linoleic fatty acids and can protect the hair and scalp from UV rays. Argan oil will not only fight frizz but is great for adding shine to dull curls without weighing down your hair. It is super lightweight, so it won’t weigh down your hair. It can be used with a deep conditioner or by itself because it penetrates the hair shaft to help keep hair moisturized. This is why it is ideal for frizz that many face during the warmer months. Argan oil is great for keeping the scalp moisturized and protected from the sun, as we tend to be outside more in the warmer months. This non-greasy, lightweight, and odorless gem comes from the seeds of a grape and while different from grapeseed extract, it has a powerful composition backing it up. Grapeseed oil has vitamin E, linoleic, oleic, palmitic, and stearic fatty acids and excellent at being absorbed into the skin. It is lighter oil than olive oil and coconut oil and will not leave you a greasy mess. Much less expensive than other oils, it has natural conditioning agents that will help soften hair, fight frizz, and add sheen without weighing down your strands or making them oily and will fight free radicals that can be damaging to your scalp and hair. Jojoba oil is a wax ester that comes from seeds of the jojoba plant found in southern U.S. and northern Mexico. This oil is unique because it is structurally and chemically similar to human sebum and extremely safe to use. It also has vitamin E, erucic, gadoleic, and oleic fatty acids and has antibacterial and antioxidant properties. It is lightweight, so it will neither weigh down your strands nor clog your pores. It will protect hair from chlorine and saltwater for all the swimming you will be doing this summer. 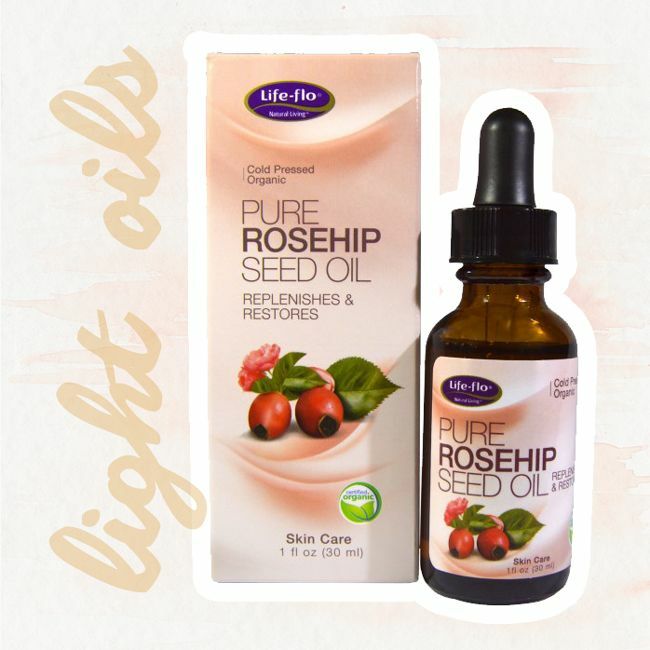 Rosehip oil is a dry oil that soaks into skin easily and harvested from the seeds of Chilean grown rose bushes. It is chocked full of vitamins, antioxidants and oleic, palmitic, linoleic and linolenic fatty acids. Rosehip oil is a wonderful emollient for dry or mature skin and excellent at aiding in repair and renewal of damaged hair follicles and scalp tissues. Great for restoring hair and skin’s elasticity and protects them both from the sun. This oil is lightweight with a non-greasy feel and absorbs well into the skin, scalp, and hair. It is great for sensitive skin (I use it as a moisturizer) and will not leave your face or hair feeling greasy during the warmer months. This oil is great for protecting your strands and skin from the blistering sun during the hotter months. One of the lightest drupe oils, sweet almond oil is extracted from edible almonds and is mild and hypoallergenic. A light oil, it fully absorbs in to the skin and gentle enough to be used on babies. It has vitamin E, potassium, zinc and linoleic, linolenic, oleic, palmitic, and stearic fatty acids. It is an ideal sealant, promoter of healthy hair follicles and will add shine to your strands. Why is sweet almond oil great for spring and summer? Sweet almond oil is excellent for spring and summer, because it penetrates easily into the skin, scalp, and hair while sealing in moisture and smoothing the hair shaft when applied modestly. It is lightweight and nourishes dry skin and hair well. Do you have a favorite oil for spring and summer?